Victory Christian tried a squeeze play twice in the 5th inning of game one Thursday. 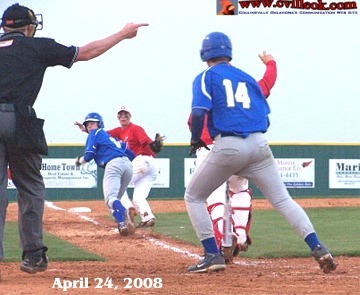 The first was fouled off. The second try (above) resulted in catcher Bobby Shoate throwing to third baseman Garret Tole for a tag out of the trapped runner. Shawnee scored 3 runs on just 2 hits to close to 7-5 in their half of the 5th. Collinsvile had padded their lead to 11-5 when I left before the end of the 6th inning. Lane Coulter's 2-run homer in the 2nd inning of the first Victory Christian game Thursday had the Cardinals up 5-2. Riley Murr came in to pitch in the 5th inning of game one with the bases loaded and no outs against Victory Christian April 24th. Randy Rogers came in to start the 6th inning. 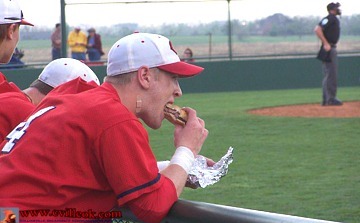 Kevin Phillips was refueling before the first game was over during the double header District Playoffs here April 24th. Harrison Mendez pitched the first four innings of game one against Victory Christian to a 7-2 lead. Collinsville's second game in the Skiatook tournament against Grove. 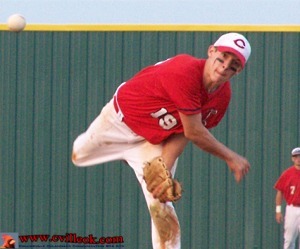 Collinsville won 11-6. 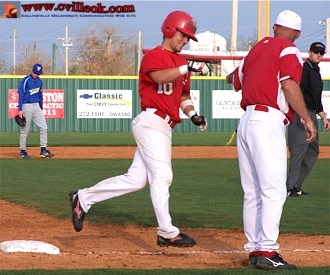 Larry Howard home run against Grove April 18th. 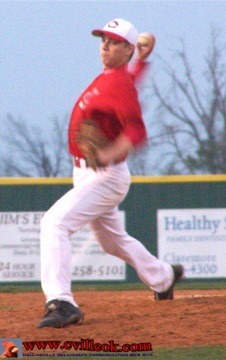 Collinsville beat Cascia Hall 2-1 to win the Skiatook tournament April 19th. 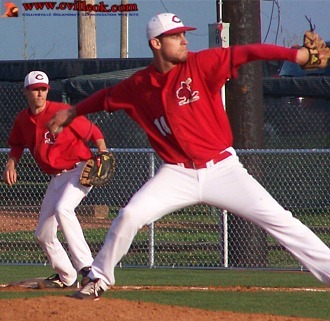 Cards won.7-4 over Holland Hall April 21st. Victory Christian Game 1 April 24th.